At least 56 people, including women and children, were killed and 80 others injured today when twin suicide bombers struck a historic church here packed with worshippers in Pakistan's restive Khyber Pakhtunkhwa province. Commissioner Peshawar Sahibzada Muhammad Anis said the bombers targeted worshippers when they were coming out of one of the oldest churches in the violence affected city's Kohati Gate district after Sunday mass. Anis said around 600 to 700 people were present inside the church at the time of the blast. However, a worshipper claimed there were 2000 to 2500 parishioners inside the church. Nearby buildings were also damaged due to the intensity of the blast. Geo News reported 56 people were killed in the blasts. 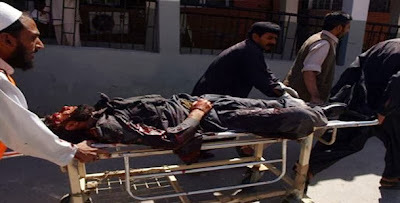 AIG Bomb Disposal Squad Shafqat confirmed that at least 45 people were killed and 80 others injured when two bombers exploded themselves up in the vicinity of the Church, named 'Pakistan Church' during Sunday prayers. The dead also included four children of three to eight years of age and one police official, he said. Injured were admitted in the city's Lady Reading Hospital. The church is situated in a very congested locality which is always jam packed with the people mostly women as the area is the hub markets and shopping centres. The Christian community lives in the vicinity and visited the church for Sunday service in large number. No group claimed responsibility for the attack, but radical Islamists have been blamed for previous attacks on the country's minority communities, including Christians. Meanwhile, Prime Minister Nawaz Sharif condemned the attack, saying terrorists have no religion and targeting innocent people is against the teachings of Islam and all religions. He said such cruel acts of terrorism reflect the brutality and inhumane mind set of the terrorists.